I saw Avatar yesterday. Oddly, I think my reaction was almost exactly the opposite of everyone else’s. Originally I didn’t plan to see it, since the ads and trailers just didn’t make it look very interesting, but then I heard a tidal wave of commentary that went like this: Yes, the story is lame, but the tech is so awesome you just have to go. It’s like being one of the first to see The Jazz Singer. So I went to see it in glorious 3D. And yes, the story was lame. But really, it wasn’t that lame. It was cartoonish, and the characters were strictly 2D, but it wasn’t so dumb that I felt like walking out of the theater at any point. All by itself that makes it better than about a third of the movies I see each year. So the story was OK, and even the message was just the usual hamhanded Hollywood stuff. But the tech? I was underwhelmed. 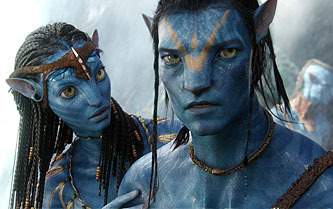 I’ve seen 3D before, and the 3D in Avatar was strictly run of the mill. The CGI was OK, but nothing special. There were some cool aspects to Pandora, but they were few and far between. Am I really supposed to be impressed by a floating rock colony? As for the aliens themselves, I’ll take it on faith that their portrayal was a technological miracle. But the end result was…..some vaguely human looking blue people that moved almost — but not quite! — as naturally as if they were real. I dunno. I just wasn’t that awestruck. Anyway, I know I’m late to the party on this. But I guess I was surprised that the story was a little more engaging than I thought it would be and that the tech was less spectacular than I thought it would be. Anyone else have a similar reaction? UPDATE: For more Avatar fun, here’s Patrick Goldstein on why grumpy conservatives hate it.